Independent Financial Advisers need a consistent supply of high quality leads to expand. How does 400 sound? That’s 400 people who are primed for a conversation with you. They were all approached in the most respectful manner. In our years of experience many will turn into the solid long-term relationships you want. You know it’s not just the number of leads, but their quality too. Each person receiving your mailing is very carefully selected. The letter cleverly peaks their interest in you. They’ll already know that you will focus on their specific circumstances. They are warming to the prospect of you being their new financial adviser. Whether we deliver 400 or 40 IFA leads to you, we know how important your first conversation with them is. Everything we do for you before that point is about establishing the trust and professionalism you are known for. offers financial advisory companies many years of experience and a proven track record of delivering large volumes of high quality leads to independent financial adviser companies. Get Your FREE Targeting Report Today! All properties are deemed affluent. Your response will be larger the broader the range of property types selected. How far away would you want your furthest new client? A typical radius is between 10 and 20 miles. Please choose an age from range. Choose what type of campaign you want to run. Please choose what mailing volume you want. For seminars, we typically approach 7-10,000 people. We can use your preferred values for typical client values (profit) or we can use estimated market values to help calculate a campaign ROI. Thank you for your time completing the form. 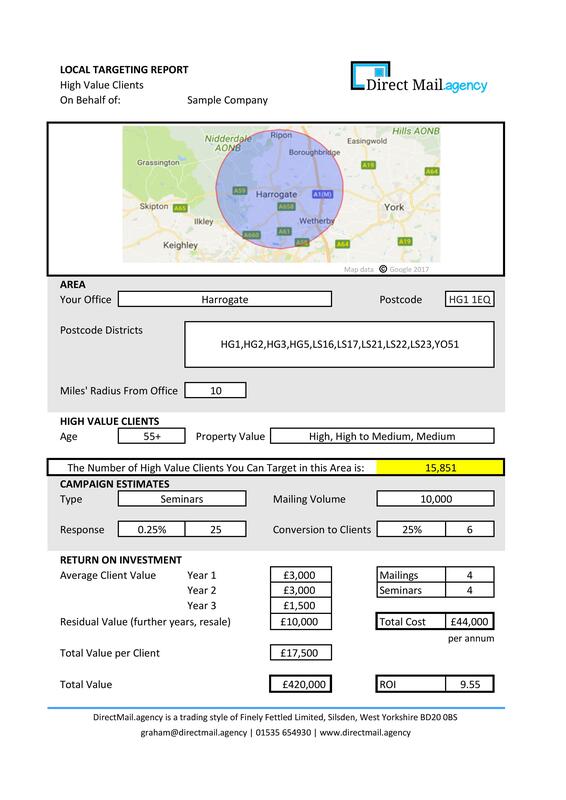 We will take all your answers and produce a tailored report that will give you a great idea of the number of people locally you can target and an estimated ROI of the campaign you’ve chosen. You can expect to receive your report within 48 hours. You are busy and want a new client acquisition strategy that delivers, is repeatable, isn’t confusing and doesn’t swamp your time. Unlike some media alternatives, you are not going to be confused. The traditional methods we deploy work well for your market, especially with the affluent. You’ll have senior, experienced people using their time, attention and proven techniques to get you the very best IFA leads. You want the best return on investment, and if you run seminars, start with our advice on where and when to hold your events. This isn’t our first gig, we’ve produced hundreds of campaigns which means you can rely on us to get high quality IFA leads. You can flexibly focus on seminars, information requests and appointments. You can turn up your marketing to the affluent system as and when you need high quality IFA Leads. What Do We Mean By High Quality IFA Leads? Our IFA Leads meet your client target profile. This is defined by the criteria that you set for potential clients. For example, leads should be aged 45 years or over, they must be living within 12 miles of your financial adviser practice or seminar, and they should be living in properties valued over £350,000 (depending on location). Our IFA Leads have responded to a mailer and have expressed an interest in your business. These are the people you want to talk to. Our years of experience tells us people who have responded by mail and who match your ideal client target profile, offer an excellent chance of conversion into long-term profitable and subsequently referring clients. For example, leads should be aged 45 years or over, they must be living within 10 miles of your financial adviser practice or seminar, and they should be living in properties valued over £350,000 (depending on location). We work with 15 different IFAs. We have been producing mailings with them for years, mailing at least 500,000 items a year. When we started working with them, their results were inconsistent and often disappointing. Year by year and step by step, we have worked through every aspect of the process they deploy. We have refined the data selection and designs to a point where they are regularly getting increased responses. All this has resulted in us producing high quality leads from larger and frequently produced mailings that means their seminars and appointments are filled with affluent people interested in them. It has also encouraged us to diversify with lead generation mailings for IFAs who do not seek to run seminars and prefer to attract people in different ways. DirectMail.agency is a brand of Finely Fettled Limited, a West Yorkshire Marketing Consultancy offering data services and integrated marketing campaigns targeting high net worth individuals. Our work helps you increase profits from new high value customers and achieve a better return from existing customers as well. We’ll support you with strategy, data, design, artwork, print, production, postage, landing page capture plus video production. Does Your IFA Practice Need Help Targeting the Over 50s?